Artemis has always put things in her mouth. If I was referring to her thumb or soother, I wouldn’t be writing this post. Perhaps it’s because she was a preemie or bottle-fed (I pumped). A Chewelry a Day Keeps the Doctor Away. KidCompanions Chewelry was designed by Pierrette d’Entremont, a jeweller and Accredited Jewelry Professional. The product was initially designed with her daughter in mind, however, it’s also intended for adults. Both Pierrette and her middle child have Tourette Syndrome and share some associated conditions like sensory issues, anxiety challenges and ASD traits. Her daughter was also born prematurely at 30-weeks gestation. The product is made and assembled in Canada in a medical grade clean room facility. They are CE marked, sourced in North America and BPA, phthalate, lead, pcv and latex free. With two shapes to choose from and tons of colours, I chose correctly in selecting a pink, heart shaped one for Artemis. She loves it and often wears her multi-purpose “jewelry” around her neck. Especially if it colour coordinates. Whenever I find her putting something else in her mouth, I remind her to use her “chew toy” and she starts chomping on it right away. It was temporarily misplaced and I noticed that she chewed on other things more often (or maybe I just noticed more). I was equally stressed as I really feel like this product is a healthier and safer way for her to deal with her chewing issues. Having it be wash and wear also makes my life easier. As for Max, he took a couple of chews and went back to playing with his trains. You can see his tiny teeth impressions in the picture. It wasn’t that he didn’t like it, more that he was busy and doesn’t have the same chewing issues as Artemis. 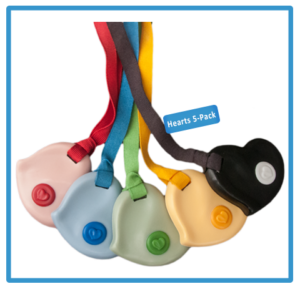 After reading an article on their blog about Who Can Benefit from Using KidCompanions Chewelry? I’m going to reintroduce it to him this week in the hopes that it can help with his transition away from his soother. Note that the product is not recommended for individuals under three years. This giveaway portion of this post has ended and the confirmed winner is Meegan W.
Disclosure: Journeys of The Zoo received a copy of this product(s) that enabled us to complete this review. This sounds perfect for Artemis, and I am intrigued to hear how it helps Max re: the soother issue. The fact that it coordinates must make mom happy too! My son chews on everything (including his clothes) and it drives me crazy. I’d get him the 18″ black circle. I like the green hearts! I’d select the Green Heart with a Green Lanyard. Blue anything for my son! I like the yellow heart! How precious is that face!! So adorable. The green heart is my favourite. The pink heart clip on for my 11 month old daughter who never took to soothers and also puts EVERYTHING in her mouth. I like the pink and black heart clips. Castian would love a Green Heart! hes always got something in his mouth, fingers, blankets, his sisters pacifier! It would be great to get one! I like the pink heart clip on. Thank you for sharing this!! My bestie’s daughter has chewing issues and she could use this!! I really like the Black Heart 18″ Undyed. My little guy is always putting things in his mouth and it would be great to have something that he could keep with him that is safe for him to chew on. I like the white circle that looks like a soccer ball. the green heart is awesome! I like the pink undyed Heart for my daughter Nykole. she is 7yrs old and has a global developmental delay and loves to chew on her clothing and jewlery that I now no longer put the jewlery on her and have to choose clothing that does not have buttons, glitter ect. It would be great to have something that is safe for her to chew on. I would choose the pink heart for my granddaughter. My son chews on everything. Right now we have a horse with no feet!! This would be perfect for him. I would pick one of the black circles. Since there is no red I would pick the pink heart! Blue heart for my Great Nephew! I’d like the White Circle 18″ Undyed, this is perfect for my son who’s always chewing anything he gets his hands on. Blue circle, this would be a great tension reliever for my son. I like the yellow heart. I would choose the Blue Heart 🙂 I think these would be a great product in our household! I’d choose the black circle with black lanyard for our youngest. Wow this is great I have an little one that has Bi-Cortical dysplasia one of the issues is relaxed mouth that causes non stop drooling and speech problems. For mouth exercises she must clamp down on special items to improve her jaw. With this she would be doing it all day long which would add so much more to her prognosis. I love the green heart with the tie dyed lanyard 🙂 and there’s a baby chewing on me as I type this post so I am really hoping I win!!! the circle and i wouldn’t care what color. this is just what we need. our 4 year old keeps putting his amber necklace in his mouth. tried to give him teething links but this would be even better. I would choose the blue heart for my son. He bites his nails. I hope this helps him. I would get the heart multi-pack! https://kidcompanions.com/wp-content/uploads/2012/07/5hearts-300×289.png my daughter loves the pink heart!!! I like the black circle. I would love the boys rule pack! I would get a green heart. These are fabulous! I know my own children could have benefited from them & I’m sure my grandchildren could as well. I’d choose the black and white circle for my fidgety son. I’d chose the blue circle for my nephew. My son puts everything in his mouth too… dirty or not! I’d love the black circle with black lanyard. I havent seen these before today. Thanks for showing this to us. I think I would choose the pink heart or the white circle. I’d like a green circle, but I didn’t see that in their site, so I’d go with a white circle. The pink heart is cute. We’d do the blue circle. Rebecca Xavier: I would choose the pink heart. I love that they are BPA, phthalate, lead, pcv and latex free. Oh wow! I just recently talked to my son’s doctor about finding something like this for him! He chews EVERYTHING!!!!! !